A-MIX - Selectkoi - Your online koi and pondspecialist ! 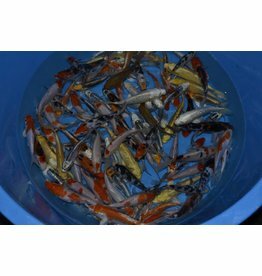 A mix is a very popular Koimix which remains after the selection of the AA / Hand Pick koi. In the A-Mix, you can find beautiful or very beautiful koi. The Koi breeder has an unselected (not selected) Koimix. This mix we sell as unselected Babykoi mix. In this mix so you can still find HQ and VHQ koi. From this Koimix he cites the High Quality Koi (AA Mix koi, koi HQ, Hand Pick Koi Koi HP, High Quality Koi). After he gets the A-Mix from the koimix. Everything after the selection remains is B-Mix.